WordPress is one of the the fastest ways to build a working website. WordPress and its themes and plugins are used by developers to create truly awesome websites with minimal effort. Many users combine our secure video streaming service with their video membership sites built on WordPress. Here we explain how to add the VdoCipher video player to your site using the VdoCipher WordPress plugin. With the VdoCipher WordPress video plugin you can stream videos on your WordPress site with the best content protection possible. Our streaming service uses encryption of videos during streaming and OTP-based decryption to provide highest protection from video piracy. We also provide a highly customizable video player, with a large variety of player themes to choose from. We are improving our plugin gradually, and would love to receive inputs from users about any new features they would like us to add. Installing the VdoCipher WordPress video plugin is pretty straightforward. Here are the steps that you would need to follow. Create account on VdoCipher. Upon sign up, you will find the Client Secret Key in the Config section in the Dashboard. This key is meant to be as confidential as a password, so it is essential that you keep it safe. You will need this key to authorize the plugin to play videos from your VdoCipher account. On your WordPress dashboard, search for “VdoCipher” on Add plugins page. Click “Install now”. This will install the VdoCipher WordPress video plugin. Click on the link “Activate”. On the top of this page, you will see a message. “Click here to configure VdoCipher”. In the next page, enter the Client secret key from Step 1. On entering the Client Secret Key, you would be shown a status: ready message. You can now upload or import videos to your VdoCipher dashboard. Once the video is added successfully, you would find the video ID as part of the video information. The following video has been added using the VdoCipher video plugin. The video uses multiple watermarks, details of which we provide below. The TinyMCE-based WordPress text editor is used by default in WordPress versions less than 5.0. To add videos to your posts and page you can use the following shortcode. You would need to replace the 12345678 with the video id. The plugin parses the shortcode behind the scenes to display the video every time the page is loaded. WordPress 5.0 has introduced a paradigm shift to the experience of adding new content to your web pages. A visual editor, comprised of blocks representing different content types, has now become default. 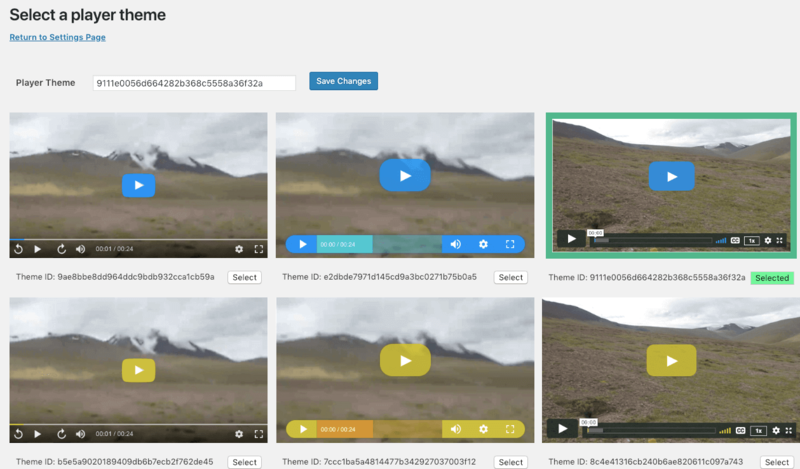 You can now add videos to your site using the VdoCipher block. The VdoCipher block only requires the video ID, so you no longer need to remember the shortcode syntax. Note that the shortcode is completely supported. 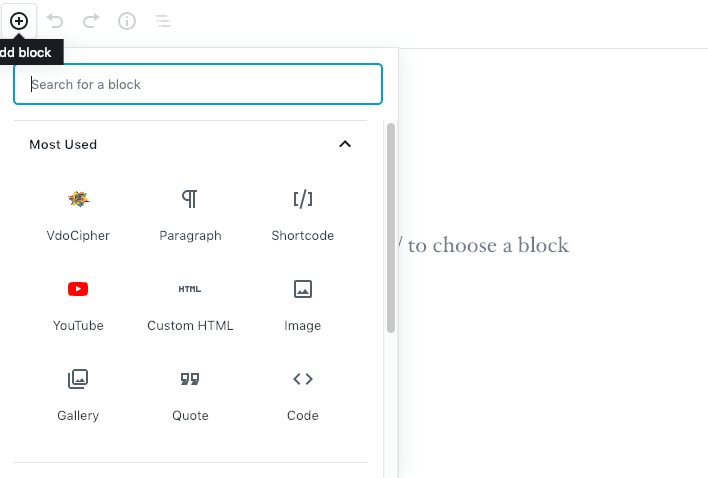 To embed using the shortcode you can either use the shortcode block or else use the shortcode inside a paragraph block. You can go to the settings menu of the VdoCipher WordPress video plugin to configure video settings. You can use our watermark feature inside the plugin to add text and images on your videos. Adding moving text with viewer information is an extra deterrent to people sharing recorded videos. You can configure the plugin to add annotation over your videos. You need to set up “annotation code” in the Settings > VdoCipher page. Go to plugins > VdoCipher> settings > annotation statement, and put the watermark code there. This code tells us how and what to embed over your videos. A sample watermark code for dynamic text watermark is given here below. 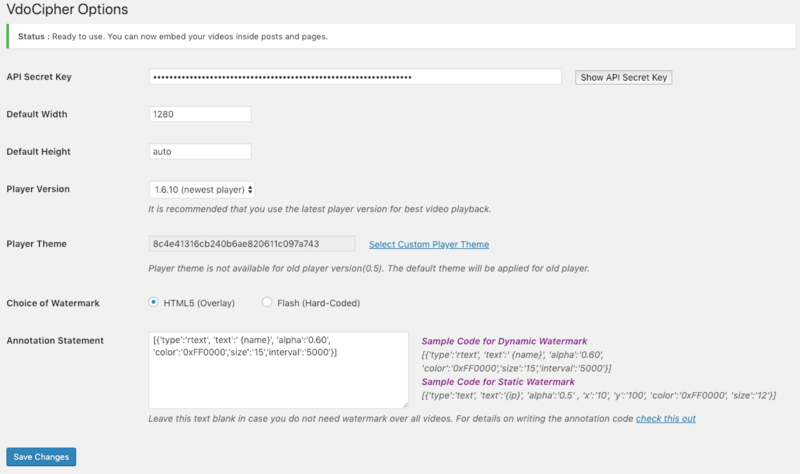 Once set, the annotation code is applied over all VdoCipher videos in your WordPress. If you want a particular video not to show the annotation, you need to pass another attribute to the short-code. You can choose from a variety of custom player themes to customize your video player. You can go to the player themes page from the options page to select the player theme that you like best. You can find all currently live player themes at Video Player Themes. If you have any specific requirements you can let us know via mail at support@vdocipher.com. While VdoCipher started out with streaming protected content using Flash, our HTML5 player now also provides Hollywood-grade security. The major advantage of HTML5 over Flash is that it delivers a superior streaming experience, and has the highest compatibility across browser. While we continue support Flash for legacy users, we highly recommend that users opt for HTML5 player for their videos. As of our WordPress plugin version 1.25 the latest video player version is 1.6.10. The VdoCipher video player is regularly improved to deliver the best user experience and to get the best data for advanced analytics. We request users to regularly update the player version to the latest player when they update the plugin. We also enable these configurations to apply on the account level. If you have such a requirement you can write to us at support@vdocipher.com and we will enable the settings for your account. For selling videos online, VdoCipher is an extremely good option to protect your content from being freely distributed. You can set up an e-commerce video platform with WordPress itself. One option would be to set up a membership site with multiple subscription options. This way your customers can pay a subscription fees and get access to content according to the level of subscription they buy. Such a system can be set up using membership plugin. Similarly, you can have a pay-per-view option for your platform where your visitors have to pay a one-time charge for watching a video. You can restrict the number of times and for how much duration you want to give access to the content. Such a system can be set up with WooCommerce plugin. You might have to use another plugin Woocommerce pay per post to achieve this. You can further customize the plugin for the restrictions and user flow that you might like to achieve. For some useful tips and suggested practices while setting up a video based e-commerce platform, read Make money from e-learning videos. So, try out our WordPress video plugin. Try the free full version 5 GB trial at www.vdocipher.com for protecting WordPress videos from download. Secure, Smooth and Affordable video streaming solution.